It's the "Battle of the Bastards"! Jon Snow makes his last stand with Longclaw. From the pulse-pounding climax of Game of Thrones. The stunning 6-inch tall bust is sculpted by Dave Cortes. The pulse-pounding climax of Game of Thrones was the "Battle of the Bastards," where Jon Snow faced off in a life-or-death struggle with evil Ramsay Bolton in one of the most ambitious and elaborately choreographed battles ever staged for filmed entertainment. A key moment was when Jon prepared for his last stand by drawing his sword Longclaw and facing the Bolton army seemingly alone. 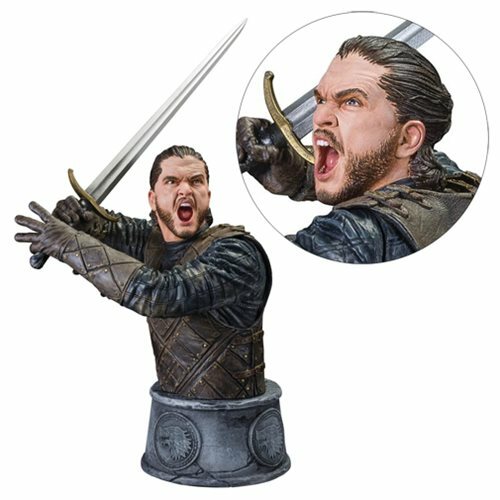 That is the moment sculptor Dave Cortes and his studio capture in this pre-painted Game of Thrones Jon Snow Battle of the Bastards Bust that measures 6-inches tall from the base to the top of his head, plus the sword extension. It comes in deluxe full-color packaging with a certificate of authenticity. The edition size is yet to be determined. Ages 14 and up.